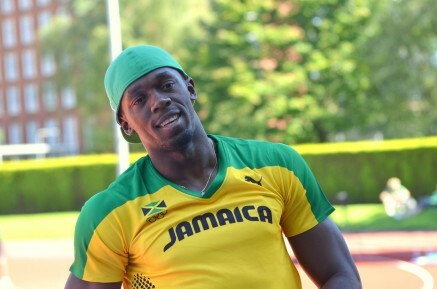 The world’s top athlete Usain Bolt (JAM) closed his 2013 T&F season with a convincing win in the 100m in the Memorial van Damme meeting in Brussels. The Glen Mills coached athlete clocked 9.80 secs to beat Mike Rodgers (USA) 2nd in 9.90 and Nesta Carter (JAM) 3rd in 9.94 secs. Kemar Bailey-Cole (JAM) placed 5th in 9.98 secs, his sixth sub 10 of the year, to close his best season to date. Winny Chebet (KEN) improved her personal best to 2:35.73 to go 2nd on the world best 1000m list for 2013 finishing runner-up to fellow Kenyan Nelly Jepkosgei. 2013 World Championships 1500m bronze medallist Hellen Obiri (KEN) placed 3rd with 2009 World Championships 1500m bronze medallist Shannon Rowbury (USA) 4th in the 1500m. World 400m Champion Christine Ohuruogu (GBR) placed 5th in the 400m with Olympic 10k silver medallist Galen Rupp (USA) 5th in the 5000m. Andrew Osagie (GBR) placed 8th in the 800m in 1:45.34 with Michael Rimmer (GBR) and Leo Manzano (USA) 4th and 5th in the B 800m.